The idea to start a tourism business in Southern Africa was born during a meal at a London restaurant in 1994 (probably on a on a cold, wet November evening). At that stage Vernon and Susan’s life consisted of working ridiculous hours in the City of London and using spare time to travel. That night, somewhere between the 1st and 2nd bottle of red wine they decided to return to Africa and to start their tourism business. In 1996, Pembury Tours started as a backpacker bus service, then in 1997 it mutated to offering day trips out of Port Elizabeth, with a transfer service to the travel trade added in 1998. In 1999, after acquiring another business, they added a bespoke Inbound travel service in 2000. I was raised and schooled in Zimbabwe and both studied and lectured at Rhodes University before leaving for the UK where I completed a Masters in Linguistics at Cambridge University. As Pembury Tours has grown, my main function is the continual training of tour consultants and ensuring that a consistently high level of correspondence and service is provided to our clients. I do, however, love to do some tour consulting despite my husband’s pleas to slow down on that front. I am at my happiest walking in the mountains on our Karoo farm, floating in the Kariega River at Kenton-on-Sea and cooking - and I often compare recipes with clients! My ambition is to see more of Africa and to celebrate my birthday on Antarctica, having already had birthdays on all 6 other continents! Born in Zimbabwe but raised in South Africa, my big claim is that I have never had a salary cheque or completed a leave form in my life. My wife, Susan maintains that I am unemployable and hence had no choice but to have my own business. 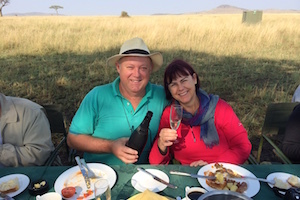 With a business degree in hand, I started business ventures in South Africa before following Susan to the UK, where I did consultancy work until returning in 1995. We started Pembury Tours in 1996, and I famously only got my first computer in 2011. I am somewhat of a sport nut, and will travels vast distances to watch the Springboks. I love open spaces and am happiest on our farm, where I think "big picture stuff".